NEW TAIPEI CITY, Taiwan, September 29, 2018–LILIN announces the release of IP cameras supporting ONVIF Profile G. LILIN currently has 130 ONVIF Profile S certified products including PTZ cameras, IP cameras, and video encoders supporting video and audio streaming. This year, we released IP camera supporting Profile G for video storage and recording. This is good news for LILIN installers, system integrators, and end users for having an open standard ONVIF interfacing with third-party video management systems (VMS) with LILIN IP cameras without hassles. ONVIF Profile G protocol is designed for IP-based video systems. A Profile G device (e.g., an IP network camera or video encoder) is one that can record video data over an IP network or on the device’s onboard storage. A Profile G client (e.g., a video management software) is one that can configure, request, and control recording of video data over an IP network from a Profile G conformant device. Profile G also includes support for receiving audio and metadata stream if the client supports those features. 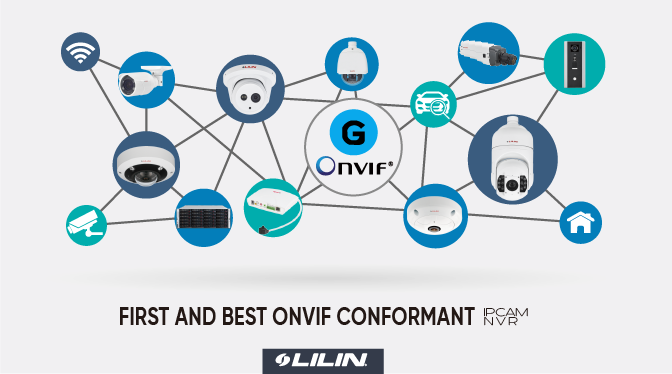 This is an important milestone for LILIN, recognized as the first camera manufacturer to become ONVIF conformant. LILIN is committed to innovation and technological excellence, we insist on developing ONVIF conformant products that help our customers benefit from the further refining of its interoperability level. With ONVIF standard, LILIN IP cameras can support VMS and NVR devices that conform to ONVIF Profile G.
Further, LILIN ONVIF Profile S conformant cameras are certified under the latest ONVIF Test Tool v. 17.12. Features of ONVIF Profile S including video streaming, audio streaming, network configuration, motion detection, and digital input meta-data, relay triggering, and PTZ control are fully supported. LILIN customers are able to benefit from ONVIF open standard by Profile S and Profile G within LILIN IP cameras. By the beginning of 2019, LILIN will start to ship IP cameras with ONVIF Profile S and Profile G built-in.